Looking for a dining experience with a difference? Then step on board La Peniche, Dublin’s finest floating restaurant. 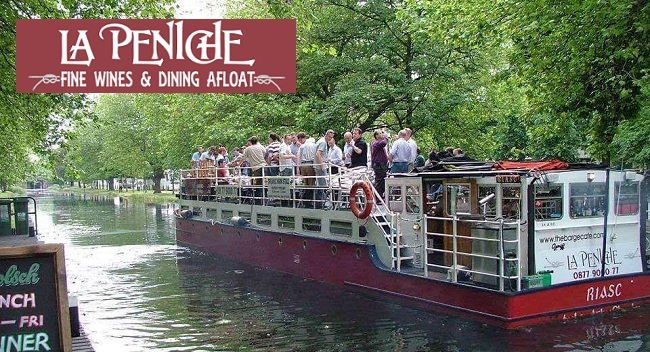 Moored on the scenic Grand Canal, this remodeled river barge cruises the canal from Mespil Road down towards Leeson street lock and then we head to Charlemont Luas Bridge and back to Mespil Road – with two cruises each evening, 6pm and 9pm. Dine in style, enjoying great quality food in a unique setting, all the while learning more about the history of Guinness and about Dublin’s Grand Canal. Undoubtedly one of Dublin’s most unique restaurants; La Peniche is perfect for a romantic meal for two, a family dinner with kids, or a fun night out with friends – and on a sunny day or evening it’s a special treat to dine up on deck. In an exclusive offer to TheTaste readers, La Peniche are offering a 3 course dinner for two people with a complimentary canal cruise for just €48.